Cycling uses large muscle groups in your legs and helps elevate your heart rate. Exercise bikes have come a long way over the last 20 years. They now offer armrests and personal fans as well as HD touchscreens and connections allowing you to view or listen to your own content. Some offer programs that simulate different courses and if properly positioned you can still have a high impact cardio workout. Check out models from Precor, Life Fitness, LeMond, Octane, Inspire and BodyCraft. 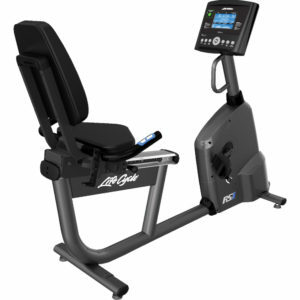 Check out these best sellers from our full lineup of exercise bikes. Building muscle as efficiently as possible is a common goal which can be easily accomplished by riding a bike. This offers a tremendous workout for hamstrings and quads. Your calves will benefit, too, especially when pointing toes downward as you’re pedaling up. Riding a bike on a regular basis is a great stress reliever. Its pace promotes blood flow to your brain and helps balance chemicals which can translate to a calm state of being. Great cardio while being easy on your knees and joints in general. And if osteoarthritis or rheumatoid arthritis is part of your life, consider an exercise bike so you can stay active. Riding on a regular basis may help lower blood pressure and regulate blood sugar. Just 30 minutes 3 or more times a week can make a difference. They don’t require much space and can easily move from room to room plus they’re affordable and can fit just about any budget.